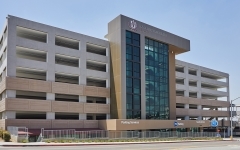 The new design-build parking structure is part of Loma Linda University’s $800 million capital improvement plan. 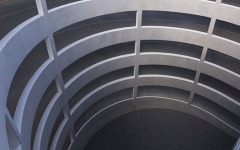 The structure includes 1,171 spaces on seven levels and services the University’s patient towers. 90% of the spaces will be utilized by employees and the remaining stalls allow for emergency-room parking on the first level. A new road, Victoria Molnar Way, was constructed with surface parallel parking and features a green belt with benches and tables on the south side. 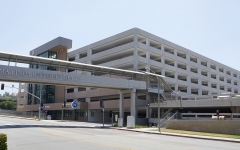 The final phase of the project included a 300-foot-long by 12-foot-wide elevated walkway connecting the garage to the campus. 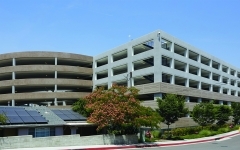 Office spaces for the Campus Security Department (Police) and the Campus Parking and Facilities Department are located on the ground level of the structure. The Security Area includes full locker rooms and showers. The elevator tower is a prominent feature of the structure. Security provisions include two glass-back elevators, closed circuit television, blue light systems and open stairs for unobstructed floors. The roof level has been prepped for a photovoltaic system to be added in the future.